This is a letter I have sent to the Good Food and Wine Show organisers. It’s truth-telling time. I would like to complain about the Chef’s Table we attended on Sunday the 13th of July 2014 at the Perth Good Food and Wine Show. I went last year to see Anna Gare, a nice small affair where she talked directly to us, the food was prepared with some skill, and actually tasted nice. If we were quick enough, we could also get an extra serve made by Anna Gare herself. This year, I invited my brother and his wife to join my fiancée and me for the Chef’s Table, which is no small expense, singing the praises of Good Food and Good Wine and an enjoyable time. We went to the 1.30pm with Antonio Carluccio, and we were utterly disappointed, each and every one of us. The first dish was small, smaller than the entrée last year. The pasta was not salted enough during cooking, so was bland. 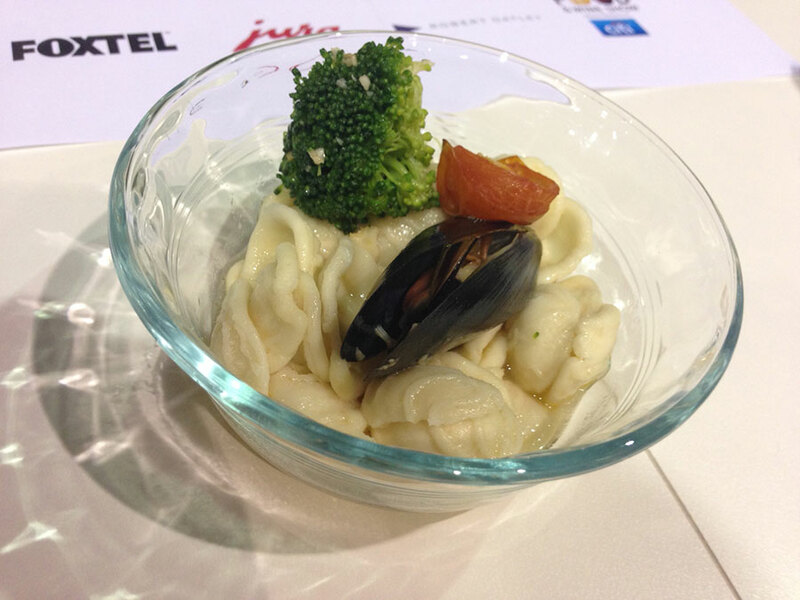 The sauce, mostly juices from the solitary mussel with a bit of wine, was tasteless, despite the warmth of chilli. The “main” course was worse still: the same sized dish as the entrée, and not even a hint of meat. It was also cold. There was, at least, more flavour this time, but I was disgusted by this point. The dessert, a cold, soggy crepe filled with some ricotta and drizzled with chocolate ganache, was probably the highlight of this sad meal, which is really saying something. The wines were not even particularly good, each having a very mineral-like characteristic, and faint bouquets. The Chef was pointed at the Theatre viewers (with free tickets,) rather than pointed at us ($55 a ticket) when it should be the other way around. We paid, but we get stuck on the side of the theatre like an afterthought. Contrast this to last year, where we were served actual food, food that required skill to prepare and cook, the wines were discussed and explained (and actually nice,) where the Chef was talking to us and with us, where we, the paying customers, were treated to a show the non-paying customers could not have. 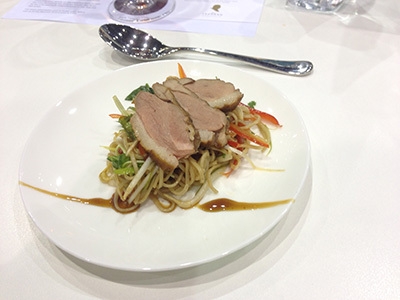 I have attached two photos, one of the 2013 Chef’s Table entrée, one of the 2014 Chef’s Table entrée. If you believe they are anywhere near comparable, then all my years of cooking have been for nought, I could’ve been serving slop with minimal effort to everyone and nobody would be any the wiser. Considering your entire show’s premise is inviting people who love Good Food and Good Wine, was this kind of food, wine and service considered good enough for paying customers? Was it estimated that people who loved Good Food and Good Wine could not tell that what they had just paid for was utter rubbish? I would like a full refund for all four of us, a sincere apology for such a failed event, and a promise that next year, the Chef’s Table would be restored to its former glory—or you have lost us (and everybody I inform of this transgression) as customers to your entire show forever. I’ve been coming for years and recommending it, even though every year it gets a bit more expensive and gets a bit worse. I can easily take the entrance fees and Chef’s Table fees and put it into a restaurant instead; at least we would get actual Good Food, Good Wine, and good service. This entry was posted in food, personal and tagged review. Bookmark the permalink.